At least five local governments in Illinois still contract with Redflex, the infamous red-light camera company at the center of one of Chicago’s most expensive corruption scandals. Some local governments in Illinois have continued to contract with Redflex Traffic Systems Inc. despite the company’s well-known history of corruption, according to a review of village and city records. 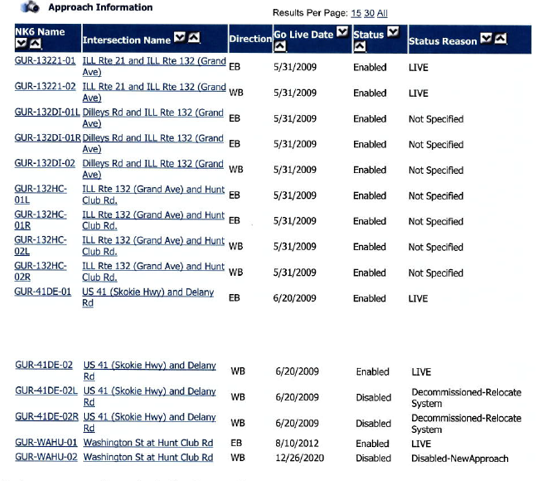 At least five municipalities close to Chicago – Gurnee, Carol Stream, Olympia Fields, North Chicago and Bellwood – still use Redflex as their red-light camera vendor, according to documents obtained through a Freedom of Information Act request. Allegations of the red-light camera vendor’s long-running bribery scheme in Chicago first surfaced in 2012, leading the city to sever its ties with Redflex. Between 2015 and 2016, both Redflex and Chicago officials received federal prison sentences in what many recognize as one of the city’s biggest bribery scandals. Redflex gained notoriety for facilitating a multimillion-dollar bribery scheme in Chicago, during which the city’s red-light camera program became the largest in the nation. And in 2013, a fired Redflex executive alleged that the company gave bribes and gifts to officials in “dozens of municipalities” across 13 other states. Despite the company’s scandal-ridden history, suburban Gurnee, Carol Stream, Olympia Fields, North Chicago and Bellwood still maintain municipal red-light camera contracts with Redflex. Gurnee, home to 12 red-light cameras – the most among the five suburbs – extended its contract with Redflex in May 2012, and again in June 2015. “Our relationship has been consistently positive and there has been no impropriety in our dealings, which led to the decision to continue to work with [Redflex],” Gurnee Police Chief Kevin Woodside wrote in response to a request for comment. Gurnee’s red-light camera program has brought in nearly $10 million over the past nine years. Carol Stream’s contract with Redflex was originally due to expire in December 2013. But the village board voted unanimously to renew the contract in October of that year, extending Redflex’s services through December 2018. According to board meeting minutes, Village Manager Joe Breinig stated that “Redflex has addressed the issues leading to publicity in the City of Chicago” and that there was “no indication of impropriety” in Carol Stream. Olympia Fields, a village in the southwest Chicago suburbs with a population of less than 5,000, operates 4 Redflex red-light cameras. Since beginning its red-light camera program in 2008, the program has brought in more than $3.6 million. Village President Sterling M. Burke said that the village’s decision to initiate and extend its contract with Redflex predates his tenure in office, and that he has little knowledge of the process. “All will be considered when time to renew comes around,” Burke said. North Chicago and Bellwood officials did not return requests for comment. North Chicago operates three Redflex red-light cameras and Bellwood operates four red-light cameras. Other municipalities that contracted with Redflex in the past have since moved on to different vendors, with local officials noting the company’s checkered past. Highland Park, for example, continued to commission Redflex until March 2017, when the city’s contract with the company expired. In May 2016, City Council voted against renewing the city’s Redflex contract, citing the Chicago bribery trial and federal investigation. “Given what has been written in the news concerning Redflex, I have to say I am not comfortable going forward with the approval of this vendor,” Mayor Nancy Rotering said at the time. The city initially approved a month-to-month extension deal between July 2013 and February 2014, despite earlier reports of wrongdoing, followed by a fixed two-year contract. Highland Park has since switched red-light camera vendors to Gatso USA. Redflex also operated two red-light cameras in the village of Orland Park until 2016 and January 2018, respectively. In February 2017, Redflex settled a lawsuit with the city of Chicago, agreeing to pay the city $20 million. Following the settlement, however, Mayor Rahm Emanuel’s administration lifted the city’s suspension of Redflex, making the company once again eligible to bid on city contracts. A recent study from Case Western Reserve University, or CWRU, found that red-light cameras likely do not increase traffic safety. Researchers looked at traffic accident data from Houston, which operated its red-light camera program from 2006 to 2010, and found that while T-bone collisions did indeed decrease during that time, non-angle collisions, such as rear-end crashes, actually increased. Moreover, rather than reducing traffic accidents, the study found that red-light enforcement cameras may have increased accidents overall. Although a 2017 report paid for by the Chicago Department of Transportation, or CDOT, recommended Chicago continue its red-light camera program, CWRU’s less favorable findings follow that of other independent research on red-light camera programs. Moreover, the Chicago Tribune reported in September 2017 that the Illinois Department of Transportation, or IDOT, often ignores its own policies by approving permits for red-light camera enforcement at intersections the agency has already identified as safe. IDOT sets an accident threshold to determine whether an intersection would benefit from red-light enforcement cameras. However, more than half of the intersections for which IDOT approved permits rated among the safest in IDOT’s own studies at the time of approval. Red-light cameras inspire little trust in local government, and can impose unfair financial burdens on residents subject to such programs. Municipalities that continue to contract with Redflex despite the company’s history only affirm residents’ low trust in their political leaders. Communities across the country are growing increasingly wary of red-light cameras. Less than 420 communities nationwide use red-light cameras, as of October 2018, according to the Insurance Institute for Highway Safety. That’s a significant decrease from their 2012 peak, when about 540 communities operated red-light cameras. Local governments across Illinois should discontinue their red-light camera programs – especially those that have continued to reward a company with a glaring history of corruption.